Learn the correct way to set your feet, golf ball, and distance from the ball for chip, pitch, sand, and flop shots. These key fundamentals are the difference between a sub-par short game and a great short game. After a few weeks of practicing with the Pure Pitch Hitting Mat you will have a better short game and shoot lower scores. If you want to have a great short game, you must have a great setup. The main fundamentals of a great short game setup are aim, foot position, ball position, and distance from the ball. The Pure Pitch Hitting Mat teaches you the correct way to do this each time making your chip, pitch, sand, and flop shots more consistent. If you want to have a great short game, you have to practice. The problem with most golfers is they practice the wrong things. To be effective your practice must focus on fundamentals. 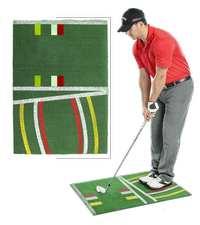 The Pure Pitch Hitting Mat forces you to practice the proper setup resulting in better short game shots. If you want to have a great short game, you have to put in reps. The more you do it the better it works. The reality is your life is busy and you can’t always make it to the golf course. The Pure Pitch Hitting Mat let’s you practice in the basement, garage, or backyard as well as the golf course. If you have any more questions about the Callaway Golf Pure Pitch Hitting Mat (Chip, Pitch, Lob & Sand Shots) ; do not see the model you are looking for; need custom options; or prefer to not purchase online, then please call us at (630) 656-1291.